One Voice Recovery: Preventing the spread of disease can lead to dialogues with drug users who may eventually seek help. (Francisco Kjolseth | The Salt Lake Tribune) Members of One Voice Recovery and the Volunteers Of America provide support and a needle exchange program for those in need in an ongoing intervention effort to keep the dialogue open and help people seek prevention services. (Francisco Kjolseth | The Salt Lake Tribune) Patrick Rezac, Executive Director of One Voice Recovery and Alex Larson visit a transient camp along the Jordan River to offer support only to find the camp had been recently dismantled. In an effort to curb the incidents of hepatitis C, HIV and STD's, the grass roots team hands out disease prevention kits and provides a needle exchange program. (Francisco Kjolseth | The Salt Lake Tribune) Remains of a removed transient camp litter the ground in West Salt Lake City as members of One Voice Recovery and the Volunteers Of America are left to keep looking for those in need of services and support as they make the rounds on Monday, Oct. 16, 2017. 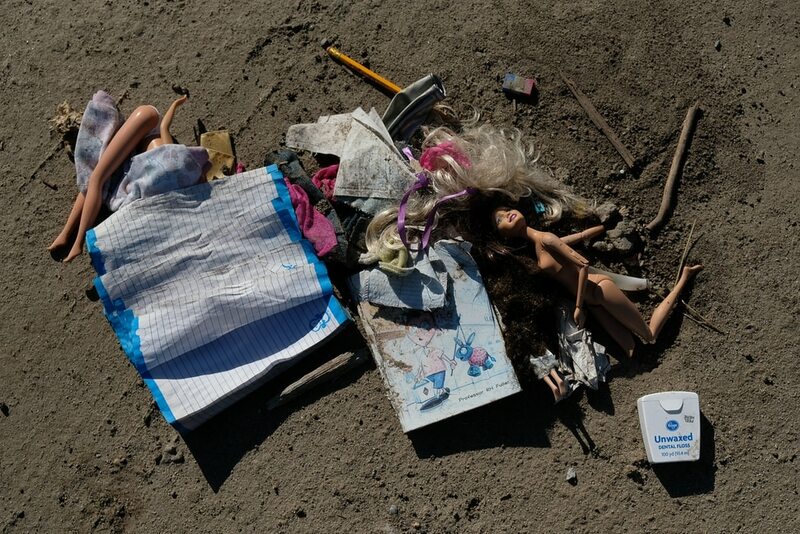 (Francisco Kjolseth | The Salt Lake Tribune) Personal belongings at a former homeless camp along the Jordan River in Salt Lake are piled up after being taken down. Members of the Volunteers of America and One Voice Recovery were visiting known camps to offer their services to the transient community. (Francisco Kjolseth | The Salt Lake Tribune) Patrick Rezac, left, Executive Director of One Voice Recovery and Alex Larson visit a transient camp along the Jordan River to offer support only to find the camp had been recently dismantled. In an effort to curb the incidents of hepatitis C, HIV and STD's, the grass roots team hands out disease prevention kits and provides a needle exchange program. (Francisco Kjolseth | The Salt Lake Tribune) Alex Larson, left, and Patrick Rezac, right, Executive Director of One Voice Recovery, check in with Ivan Vasquez, 58, who is homeless and a heroin user in West Salt Lake recently. In an effort to curb the incidents of hepatitis C, HIV and STD's, Rezac's grass roots team hands out disease prevention kits and provides a needle exchange program. (Francisco Kjolseth | The Salt Lake Tribune) Alex Larson, left, and Patrick Rezac, right, Executive Director of One Voice Recovery, check in with Ivan Vasquez, 58, who is homeless and a heroin user in West Salt Lake recently. In an effort to curb the incidents of hepatitis C, HIV and STD's, Rezac's grass roots team hands out disease prevention kits and provides a needle exchange program. (Francisco Kjolseth | The Salt Lake Tribune) Patrick Rezac, Executive Director of One Voice Recovery, checks in with Ivan Vasquez, 58, who is homeless and a heroin user in West Salt Lake recently. In an effort to curb the incidents of hepatitis C, HIV and STD's, Rezac's grass roots team hands out disease prevention kits and provides a needle exchange program. (Francisco Kjolseth | The Salt Lake Tribune) Jolene, 43, center, who has been homeless for 6-years is visited by members of One Voice Recovery Patrick Rezac, left, greeting her dog Atlanto and Alex Larson as they provide support and a needle exchange program. (Francisco Kjolseth | The Salt Lake Tribune) Jolene, 43, center, who has been homeless for 6-years is visited by members of One Voice Recovery Alex Larson, left, and Patrick Rezac, as they provide disease prevention kits and a needle exchange program. (Francisco Kjolseth | The Salt Lake Tribune) Jolene, 43, who has been homeless for six years is visited by Alex Larson, Executive Director of One Voice Recovery as he provides a needle exchange program for folks along the Jordan River in Salt Lake. (Francisco Kjolseth | The Salt Lake Tribune) Machele Nieto, a homeless outreach worker with Volunteers of America tags along with Patrick Rezac of One Voice Recovery who provides a needle exchange program for a homeless man in a tent who did not want to be identified. The two teams were making the rounds with the homeless community along the Jordan River offering support and services. (Francisco Kjolseth | The Salt Lake Tribune) Remains of a removed transient camp litter the ground in West Salt Lake City as members of One Voice Recovery and the Volunteers Of America are left to keep looking for those in need of services and support as they make the rounds on Monday, Oct. 16, 2017. (Francisco Kjolseth | The Salt Lake Tribune) Patrick Rezac, Executive Director of One Voice Recovery, removes a needle left behind at a former transient camp in West Salt Lake recently. In an effort to curb the incidents of hepatitis C HIV and STD's, the grass roots team hands out disease prevention kits and provides a needle exchange program. (Francisco Kjolseth | The Salt Lake Tribune) Members of One Voice Recovery and the Volunteers Of America team up as they check on a former homeless camp near the railroad tracks in West Salt Lake. One Voice Recovery provides a needle exchange program for those in need in an ongoing intervention effort to keep the dialogue open and help people seek prevention services. (Francisco Kjolseth | The Salt Lake Tribune) Patrick Rezac, Executive Director of One Voice Recovery, provides a needle exchange program in an effort to curb incidents of hepatitis C, HIV and STD's. Rezac, a former addict himself hopes to offer a doorway for dialogue to help people seek prevention services. One-time intravenous drug user Patrick Rezac crouches under branches and pushes by brush as he hikes along the Salt Lake Valley’s Jordan River, packing supplies, including syringes, while seeking out homeless campers who suffer from drug addiction. One Voice Recovery, the organization Rezac founded, seeks to build bridges with intravenous drug users in hopes they will eventually seek treatment. It’s also a common sense approach to reducing HIV and hepatitis C infection, which can be contracted by sharing needles. One Voice Recovery exchanges new syringes for used ones to drug users, whether they are in camps or apartments or houses. Rezac and his team make 40 to 50 home deliveries a week. Syringe exchanges are controversial in Utah. Kits that include needles and other items aimed at helping drug users safely inject illegal substances have been derided as “party packs” by House Speaker Greg Hughes. The Draper Republican and others say they encourage people to use heroin or methamphetamine. Rezac concedes that getting politicians to see addiction as a health problem will require education and new messaging to help debunk old stereotypes. The typical addicts these days, he explained, are white men and white women between ages 35 and 55. Beyond that, disease prevention saves millions of dollars. In the past three years, Utah has spent $25 million on treating hepatitis C patients alone. Syringe kits cost about $3, Rezac said. 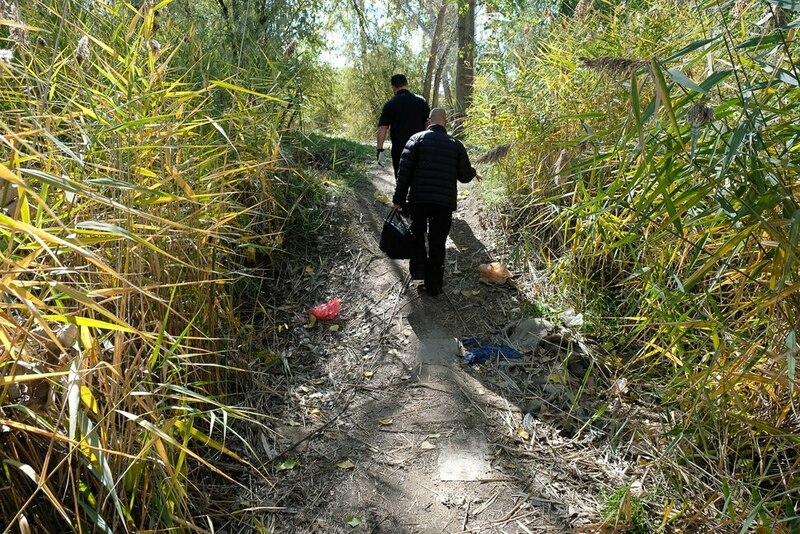 Near the Jordan River on a recent Monday, Rezac and team member Alex Larson, approached Ivan Vasquez, a 58-year-old heroin user. They took personal information and made a risk assessment for Vasquez. They also provided him with clean syringes, condoms and information on other services, including treatment. Operation Rio Grande began Aug. 14 to reduce violence and drug trafficking near The Road Home shelter. 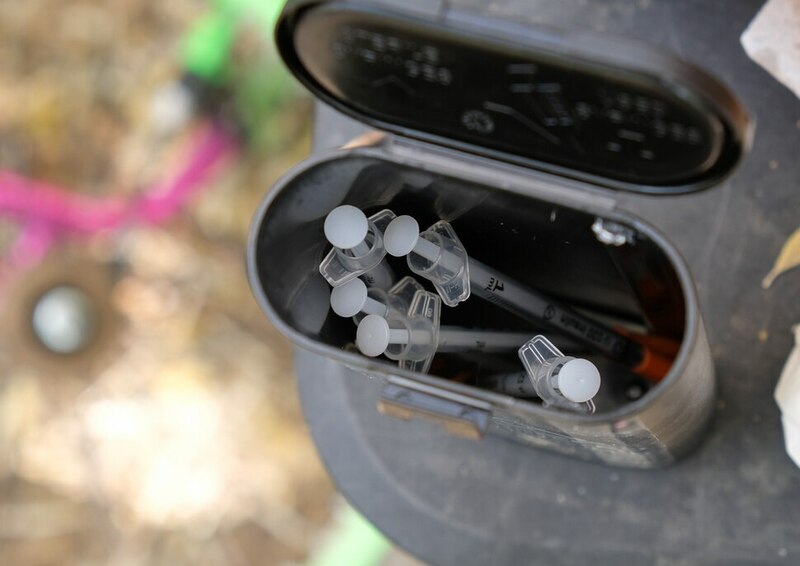 The crackdown upended one syringe exchange program offered by the Utah Harm Reduction Coalition, which set up twice a week on 500 West. That program is now at the Fourth Street Clinic on Tuesdays from 3 to 5 p.m. It also is beginning an outreach program. Rezac, on the other hand, says his program continues to grow. In the past 90 days, he and trained volunteers have given out some 11,000 clean syringes, he said. They have taken in about 8,000 used needles. One Voice Recovery also passes out condoms in an effort to stop the spread of sexually transmitted diseases. One Voice Recovery outreach is helped greatly by its partnership with Volunteers of America — Utah, Rezac said. VOA also tracks homeless campers and provides such items as food, water, clothing and sleeping bags. VOA is not involved in exchanging syringes. Farther along the river, the team comes upon a woman called Jolene, 43, who said she has been homeless for six years. Her drug of choice is methamphetamine and she accepts clean syringes and other things from Rezac and Larson. She started using meth at age 13, she said, but stopped at 27 when she became pregnant. She relapsed at age 35 and asked her cousin to bring up her son. Rezac said there is hope for people like Jolene. The first step, he said, is showing them that someone cares. Another important piece of information the public should know, Rezac said, is that some 23 million Americans live in long-term recovery — that is, they overcame their addiction. Addiction does not discriminate, he said. It can overtake people from all walks of life. Rezac was leading a successful life in the San Francisco Bay Area when he first tried cocaine. Before long, he was intravenously shooting methamphetamine. Many things can lead people to drug addiction, and it can be difficult to recover — but not impossible. Rezac said he entered treatment 18 times before he stopped using drugs. In a hidden area of trees and brush along the Jordan River, Rezac and Larson came upon a tent. Inside is a 58-year-old man named Odie who said he suffers from addiction to methamphetamine and alcohol. He’s been homeless for six months. It’s a tough life, he said of his current situation. He is thankful, however, that Rezac’s team looks in on him. The syringe exchange is critical, he said. More information on the program can be found at http://onevoicerecovery.org.